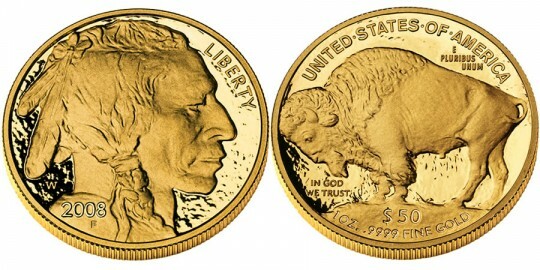 ****UPDATE - New Version - The US Mint released the 2010 American Buffalo Gold Proof Coin on June 3, 2010. The American Buffalo Gold Coins have the distinction of being the first .9999 fine 24-karat gold coins ever struck by the US Mint. Authorized by the Presidential $1 Coin Act of 2005, these coins first appeared in both bullion and proof qualities in 2006. Many should be familiar with the design used on the Gold Buffalos as it is the same (slightly modified) that was used on circulating nickels in the United States from 1913-1938. Known by most as the "Buffalo Nickel," it was created by James Earle Fraser. Most accounts report that Fraser used three different Native American Chiefs as models to create a composite image used in the profile on the obverse of the coin. Two of the models almost positively identified are Chief Iron Tail of the Lakota Sioux and Chief Two Moons of the Cheyenne. The third Indian Chief's name could not be recalled by Fraser, but many have claimed the honor for themselves. The American Buffalo (also known as a bison) seen on the reverse of the coin is said to be a rendering of "Black Diamond" who lived in captivity in New York. The initial design for the nickel had the buffalo on a mound, but was changed the same year of issue to show the buffalo on a thinner line. The Gold Buffalos revert back to the original concept called for by Fraser with the mound. Fraser was born in Minnesota in 1876 and grew up experiencing the American West with his father who worked on the railroad. Artistic at a young age, he would study the profession and even worked with famed sculptor Augustus St. Gaudens for four years. Fraser's work can be seen in many monuments and statues throughout the nation, but he will probably always be best remembered as the designer of the American Buffalo Nickel.